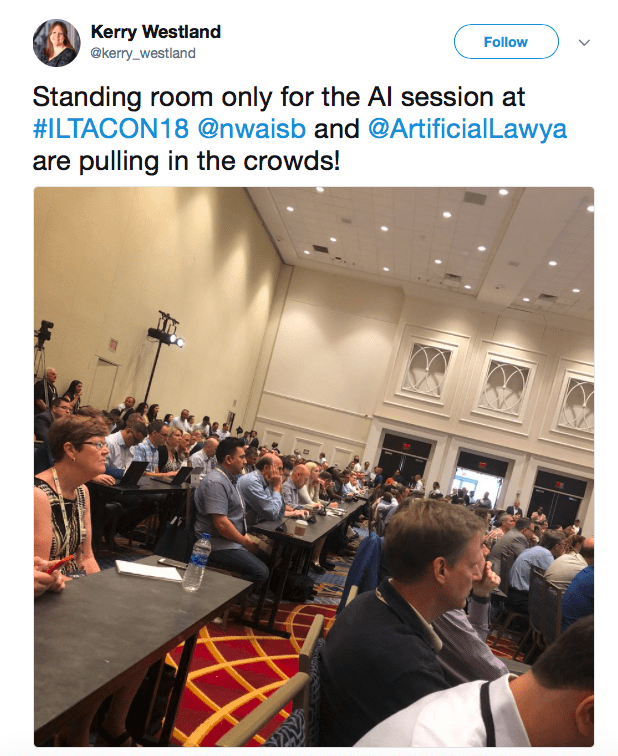 1st Legal AI Session Write Up, Looks Like ILTACON Loves AI. 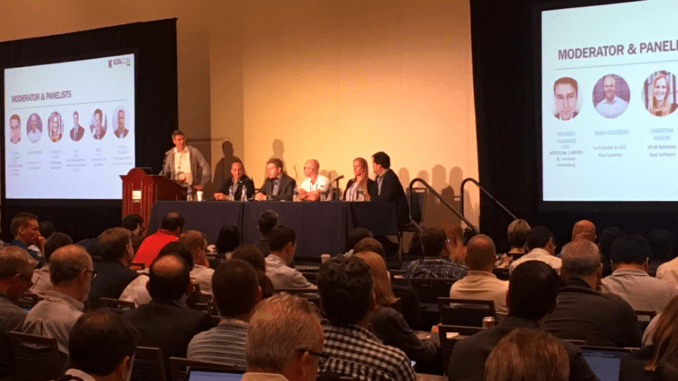 Monday saw the first legal AI session of the massive ILTACon legal tech conference at National Harbor, USA. 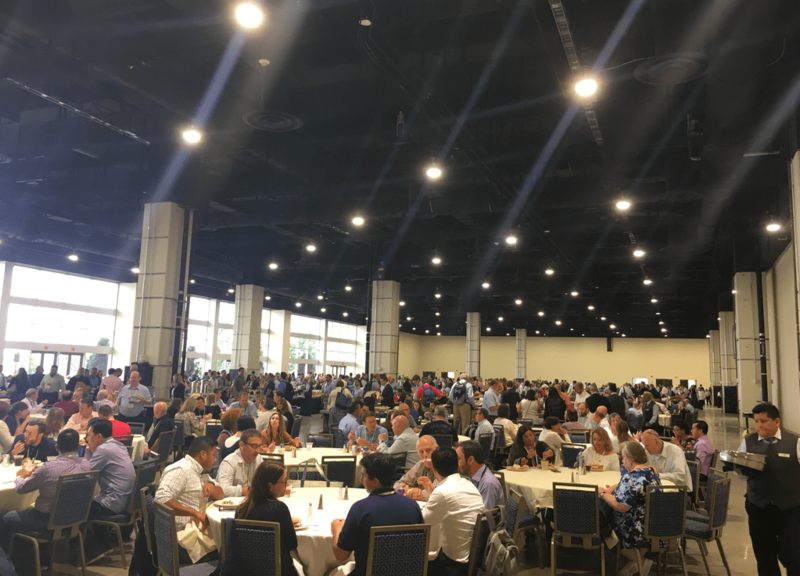 The theme was ‘where is AI having an impact?’ and it was clear that just as a subject the use of NLP and machine learning is certainly making waves still among the ILTA members. It was standing room only for this session and there was a line of people trying to get into the huge room for several hundred people. One legal AI company boss later told Artificial Lawyer that even he couldn’t get in. As moderator of the session I asked the audience how many worked in firms where they were using an AI system of some sort, excluding ediscovery systems. Somewhere between a fifth and a quarter of the room put their hands up. Two or three years ago that would have been a far smaller number. ILTA also a great cross section of law firms from across the US, from single lawyer firms to New York giants, so to get almost a quarter of the room say they are already using an AI system is in itself something of a watershed moment for the legal AI sector. Now, onto the panel. As I was moderating it was a bit tricky to write up at the same time, so I’ve amalgamated the session and what everyone said into a blend of key points. The panel was: Bill Koch, Chief Knowledge Officer of US law firm Womble, Noah Waisberg, CEO of Kira Systems, Christina Wojcik, VP Solutions at Seal Software, James Lee, Co-founder of LegalMation – a legal AI company working in the litigation area, and George Tziahanas, Luminance’s US regional head, and myself, Richard Tromans as moderator. The key question was: where is AI actually having a notable impact on law firms and how they do work for clients? This led in turn to a series of related points, covering areas such as efficiency, impact on training, how it changes the client relationship and another training issue: how much time do you need to train the system. Let’s start with efficiency. Luminance said they were seeing efficiency gains in review work between 30% and 50% in terms of time saved, the other companies broadly concurred, but Kira added that in types of work that were very standardised already they could see 90% improvements in efficiency. The point was then added that the key benefits of this are two-fold: the obvious one, which is that you make the clients very happy because you can do this tedious, manual work much faster; the second point was that you can then focus on doing higher value work. This led to some interesting insights from Bill Koch, who as someone from a law firm, found a lot of attention from the audience. Koch noted that though time and money savings for clients was important, that was was not all of it. 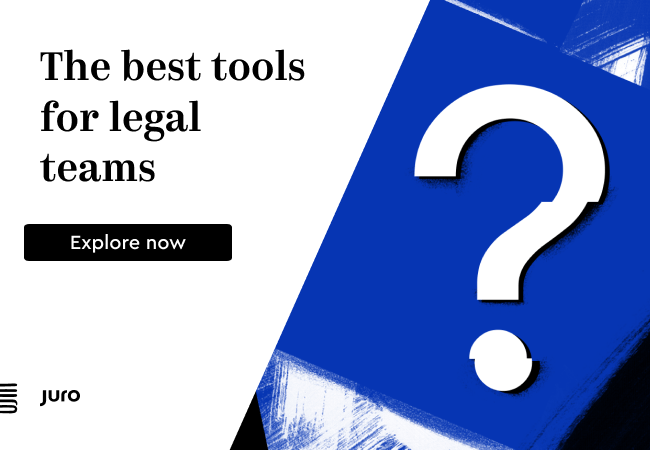 He stressed that clients don’t really want their law firms to be spending all their energy and effort on routine work – that’s not why they engage highly trained legal experts. The panel also pointed out that there is more to life than review. There are companies such as LegalMation that helps lawyers quickly deal with discovery requests in litigation using a lot of great NLP and machine learning techniques. This also saves law firms time and the clients money. It’s also work that clients don’t really want to pay a lot for. Same issues – different part of the law firm. Then there was the issue of insights into data, with Noah Waisberg saying that analysing a set of contracts with NLP allowed a firm to quickly understand ‘what is market’, i.e. what is the firm’s own standards, or, of examining someone else’s paper, what they have developed as standard. This may sound like something you can do by hand – and you can – but if you want to be thorough and examine hundreds of contracts, perhaps without being able to bill that time, then using an AI system makes sense. It could also simply be a useful output from a review exercise for a client matter. I asked whether it was law firms that should be doing this work or not and there wasn’t really a clear answer on that. One view was that process work would be sent out to subsidiaries that were totally owned by law firms, but separate from the main partnership, and in such locations a lot of the AI tools would be used for review. One of the thorny issues was the point about training the ML. Didn’t it erode the efficiency benefits? Perhaps unsurprisingly the AI companies said no. They pointed out that some types of matter didn’t really need much training at all. Koch added that any learnings the NLP has been provided with are not lost either, i.e. perhaps you put in a lot of time at the beginning of training one type of review process, but you don’t lose that. It was certainly clear from the audience questions that training time was a factor that was a concern and it looks like the industry may need to be able to reassure more easily on this issue. Last but not least was an audience question about training of associates, i.e. AI messes up training. But the view of the panel was that it did not. 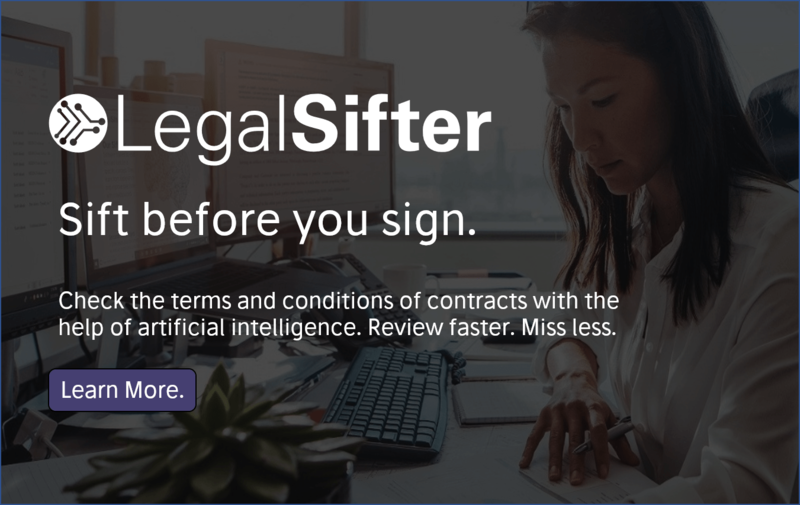 Using an AI review tool could actually help associates to better understand legal clauses in certain types of document. And, let’s face it, is highlighting passages of text really the best way to train a young lawyer…? OK, that’s all from the first day. I’d better go and see some other sessions…! P.S. below is a photo of the meal hall….wow, talk about feeding the 5,000. ILTACon really puts all other legal tech events in perspective.